This week's list had a gimme, so I knew I wouldn't have to search very hard. Was able to easily pick up some lobster that was from Maine. I realized all of my meals have been either lunches or dinners, so to mix things up I wanted to get a breakfast meal involved. I knew I wanted to make a Lobster Benedict. I'm gluten-free so it was done on top of a sweet potato hash. It was also my first time poaching an egg and making hollandaise sauce. Everything was from scratch and amazing! Devon, enjoying razor clams after an Old Crow concert on the Portland waterfront. What a night! I was very happy to see these were available at the market. They came from Biddeford pool, just a few miles south of Portland. I used to walk around and forage in the marsh when I lived in the area, and never found razor clams. I'm glad to see there is a market for this local delicacy. I sauteed them with some Casco Bay Butter, garlic, red pepper, and a touch of white wine. They were quick and delicious as a late night snack with a glass of wine. Jonah Crab was the only species on my list that was found. And I had never bought live Jonah Crabs before. They are very easy to cook because I just steamed them for 20 mins. However, you really must work for the meat. Most is in the claws and a little in the legs. A lot of cracking is necessary and it can get messy! This is a fine crab to buy if you are having an outdoor cookout or at the beach and don't want to spend too much money. This weekend we harvested honey from our bee hive for the first time ever. As a result we located a recipe in our bee manual for honey glazed sea scallops that we were excited to try. I felt guilty about going with sea scallops again instead of the quahogs, which I hadn't had on my list all summer, until I sat down to eat my honey glazed scallops. I usually only buy halibut during the Maine (inshore) fishery, which happens in May-June. But halibut from the groundfish fishery seems to be more available lately, especially beyond the coast- so I was pleased to find it in Bangor. This week I was looking for scup, peekytoe crab, periwinkle, and black sea bass. Whenever I am assigned a species I am not too familiar with, I do some research about it. This week while looking into it more I found current data from the Atlantic States Marine Fisheries Commission (ASMFC). According to the ASMFC, “the 2017 benchmark stock assessment found black sea bass not overfished nor experiencing overfishing.” After finding this data I was open to trying black sea bass. This week I found scup and black sea bass. I was planning on buying the black sea bass, but after looking at the two fish, the scup looked fresher, so I ended up buying it. I cooked it differently then the last time I had it, and it did not disappoint. I seasoned it with salt and pepper, steamed it whole with ginger slices and served with scallions. Very tasty. Someone else was also very interested in the lobster! After boiling the lobsters, I picked them clean and then sautéed the meat very quickly in butter, just to coat it. Delicious! This week I had to choose between smoked mackerel and pollock fillet. I'm never really been a huge fan of "smoked" flavoring, so I ultimately chose the pollock. I also think (but am not sure if this is true) that mackerel is an oily, "fishy" tasting fish, which does not appeal to me (I should give it a try if it comes up again and see if I am correct in that assumption). Since there's been a lot to harvest lately in the garden, I thought it would be nice to have an "all locally grown/caught meal". 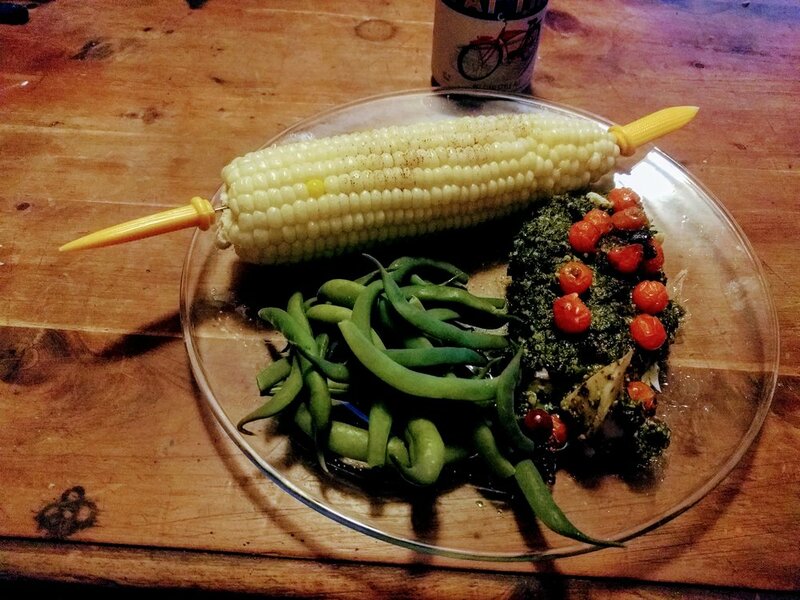 I steamed green beans from my garden, smothered the pollock in pesto (made from basil in my garden) and baked it, put cherry tomatoes from the garden on top of the fish, and boiled corn on the cob from gC Farms. The pollock was delicious! The fillet was much thicker than I had anticipated, but it was incredibly easy to work with and I would definitely buy it again after this experiment. It's a great bang for your buck fish. This was a great piece of swordfish, very thick and cooked so very well. A little bit of seafood seasoning and rosemary grilled in aluminium foil. It was amazing! "I was disappointed I couldn't find my selection at the market I visited. I stopped at the supermarket to pick up a rotisserie chicken and thought I would check the seafood dept. I was surprised they had WILD Gulf of Maine mussels. Most of the fish markets I visit only carry farmed mussels. They were inexpensive, sweet and on the smaller side." This was my first time cooking a "meatier" fish. Aside from the fact that my house smelled of fish afterward, I really enjoyed the swordfish. 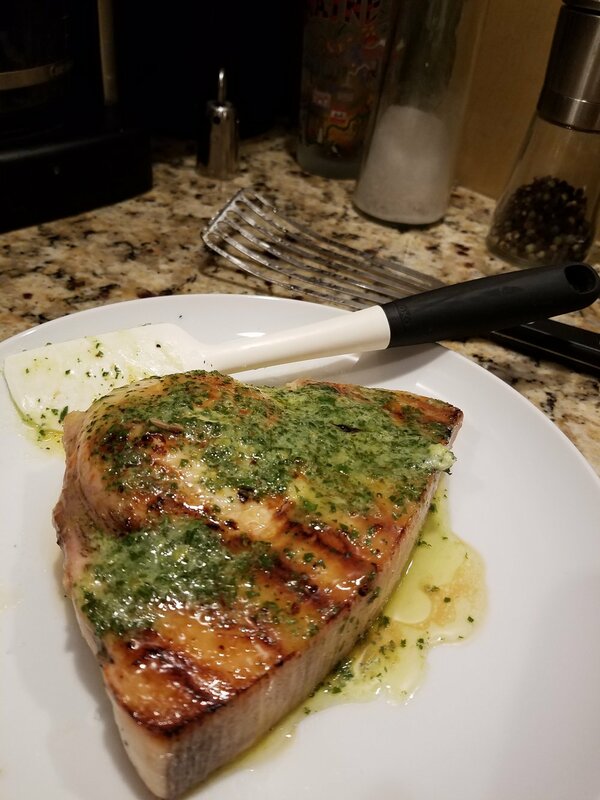 I pan seared it and finished with a lemon-basil butter. Next time I would opt for cooking it on the grill...outside! My family was in Martha's Vineyard for the week and seeing the difference in what local species are available in locations closer to fishing ports vs. what is available in New England was eye opening. Much of the fish where we live (in Southeast CT) is bought from the New York fish market and can be coming from anywhere in the world. However on the island the stores we went to (Edgartown Seafood, Oak Bluffs Fish Market, Menemsha Fish Market) all had prominently labeled locally caught species like cod, tuna, lobster, swordfish, bluefish, and striped bass. In CT many of these fish cannot be found locally caught in fish markets, if at all. It was refreshing to see how many more options were available in the shops supporting their local fishers. However to expand this to where we live will probably take some many improvements to the fish distribution and supply chain. I baked the cod in a mild salsa and then after placed some cilantro and avocado. it was very delicious. I bought some squid from the local catch tent at the farmers market down the steet. It was already cleaned and I had a choice of just the hoods or the hoods and the tentacles. I choose just the hoods for no reason. I did a simple buttermilk and breadcrumbs mix and fried them up. I also made a sort of sauce from mayonnaise a dill marinade banana pepper basil and some red hot peppers.